Director – Andrew Stanton, Screenplay – Mark Andrews, Michael Chabon & Andrew Stanton, Based on the Novel A Princess of Mars by Edgar Rice Burroughs, Producers – Lindsey Collins, Jim Morris & Colin Wilson, Photography – Dan Mindel, Music – Michael Giacchino, Visual Effects Supervisors – Peter Chiang & Sue Rowe, Animation Supervisor – Eamon Butler, Visual Effects – Cinesite (Supervisors – Christian Irles, Helen Newby, Andy Robinson, Ben Shepherd & Simon Stanley-Clamp), Double Negative (Supervisors – Ryan Cook, Ken McGaugh & Paul Riddle) & MPC, Special Effects Supervisor – Chris Corbould, Makeup Design – Bill Corso, Creature Effects – Legacy Effects (Supervisor – John Rosengrant), Production Design – Nathan Crowley. Production Company – Disney. In 1881, Edgar Rice Burroughs is called to the estate of his uncle John Carter and given a strange bequeathment. Amid this, Burroughs finds Carter’s journal that tells his amazing story. In 1868, Carter was mining for gold in Arizona when he was caught between escaping from forcible recruitment by Confederate soldiers and attacking Apaches. Fleeing, he hid in a cave in the hills where he was forced to fight off a strange man. Upon picking up an amulet dropped by the man, he was transported to another world, which he later found was Mars (or Barsoom as it is known by the locals). In Mars’s lighter gravity, Carter had far superior physical ability, including greater strength and being able to leap hundreds of feet. He was captured and made a prisoner of the three-metre tall green-skinned Tharks. Meanwhile, the free city of Helium was under attack by the mobile city of Zodanga whose warlord Sab Than was aided by the godlike Therns who had granted him the power of the Ninth Ray. Helium’s ruler Tardos Mors wanted his daughter, the princess Dejah Thoris, to marry Sab Than to bring an end to the conflict, but she refused and fled. Carter was able to leap into action to save her from pursuit by Sab Than. She wanted for Carter to come and fight to free Helium but he only sought to regain the amulet and the means to return to Earth. Gradually, through their journey together, Carter came to discover feelings for Dejah. With her recaptured by Sab Than and taken away to be married, Carter realised that the Therns were planning to have her executed on her wedding night. John Carter was the creation of adventure writer Edgar Rice Burroughs (1875-1950), who is best known as the creator of Tarzan. In fact, the story that John Carter first appears in, A Princess of Mars (1912), was Edgar Rice Burroughs’ first published work, originally being serialised under the title of Under the Moons of Mars in The All-Story magazine, gaining its more well-known title upon book publication in 1917. Burroughs was concerned about what people would think of him for writing such an outlandish story and substituted the pseudonym ‘Normal Bean’, although this was mistakenly typed up as Norman Bean. A Princess of Mars enjoyed popularity and launched Burroughs’ career as a writer. Burroughs would go on to write a further ten novels set on Barsoom, featuring John Carter and/or his descendants. Burroughs drew on the vision of Mars as inhabited and filled with canals that had been popularised in the 1870s by Giovanni Sciapelli and later Percival Lowell before such was later proven to be unscientific. With the John Carter stories, Burroughs created a genre that would become known as the ‘planetary adventure’ or ‘planetary romance’ that falls somewhere between space opera and fantasy, usually being centred on a complexly detailed planetary location with a hero engaged in adventures with various exotic species. The John Carter stories enjoyed great popularity and have had a wide influence that ranges from copycats like John Norman’s Gor series, to inspiring the adventures of Flash Gordon, George Lucas’s Star Wars series and James Cameron with Avatar (2009). Edgar Rice Burroughs’ influence on the fantasy of Mars is such that works of science-fiction – Kim Stanley Robinson’s Mars series and tv’s – call the first city on Mars Burroughs, while John Carter also makes an appearance in the League of Extraordinary Gentlemen graphic novels and the scientific actuality of Barsoom is deconstructed in Philip Jose Farmer’s World of Tiers books. Fans of the series are reported to run all the way from Carl Sagan to Josef Stalin. While other of Edgar Rice Burroughs’ books and series have enjoyed great popularity on the big and small screen – Tarzan has appeared in some eighty films and tv series; Burroughs’ series about the prehistoric lost world of Caprona has spawned three films, The Land That Time Forgot (1974), The People That Time Forgot (1977) and The Land That Time Forgot (2009); and there has been a film made of the first of the Pellucidar series with At the Earth’s Core (1976) – John Carter’s adventures have eluded filmmakers for decades. Between 1931-6, Bob Clampett, later a director of numerous Looney Tunes shorts, worked on a planned feature-length animated version of A Princess of Mars at MGM but initial test reels were not positive and the idea was dumped. (About a minute-and-a-half of this test footage survives and can be found on YouTube). Cult stop-motion animator Ray Harryhausen, known for The 7th Voyage of Sinbad (1958), Jason and the Argonauts (1963) and Clash of the Titans (1981), had planned a version at various points between the 1950s and 70s. From the late 1970s, Disney were planning their own live-action film amid the post-Star Wars (1977) science-fiction boom. John McTiernan, director of Predator (1987) and Die Hard (1988), signed on in the late 1980s but this version never ended up going ahead. The current John Carter film began in 2004 when Paramount purchased the rights, purportedly inspired after aintitcool.com’s Harry Knowles praised the books and was even co-opted as a producer at one point. Robert Rodriguez, director of From Dusk Till Dawn (1996) and Sin City (2005), signed on to direct and insisted on the employment of celebrated fantasy artist Frank Frazetta who had illustrated many of the modern reprints of the John Carter books. It was planned that the world of Barsoom would be created by the digital backlot process that Rodriguez had successfully used on Sin City. However, Rodriguez was forced to leave the project after he quit the Director’s Guild over their refusal to co-credit Frank Miller as director on Sin City, making him unable to be employed on any studio production. Rodriguez was replaced by Kerry Conran who was briefly a hot name after the retro-science-fiction adventure Sky Captain and the World of Tomorrow (2004), also shot in the digital backlot process. The project was inherited for a time by Jon Favreau, director of Iron Man (2008) and Cowboys & Aliens (2011), but none of these versions went ahead. In the interim, with the book in public domain, there was Princess of Mars (2009), a cheap version made by The Asylum, a company known for a great many low-budget film that cheekily copy bigger budgeted works, starring a badly miscast Antonio Sabato Jr as John Carter and Traci Lords as Dejah Thoris, which did manage to remain surprisingly faithful to the book. The rights passed from Paramount to Disney in 2007 where the project was taken up by Andrew Stanton. Stanton has been working as an animator at Pixar for a number of years and had contributed to the screenplays of several of their films, including Toy Story (1995), A Bug’s Life (1998), Toy Story 2 (1999) and Monsters, Inc. (2001), before making his directorial debut with Finding Nemo (2003) and going on to Wall-E (2008), which is probably Pixar’s finest film to date. Joining Brad Bird who made a resplendent showing with Mission: Impossible – Ghost Protocol (2011) a few months earlier, Andrew Stanton becomes another Pixar director who seemed to be looking beyond animation to live-action. Stanton co-writes John Carter with Michael Chabon, a novelist whose book became the basis for the film Wonder Boys (2000) and has written a number of other works that have regularly dabbled in genre territories like superheroes and alternate history from a literary perspective, who also co-wrote the script for Spider-Man 2 (2004). Appropriately, John Carter was released on the year of the 100th anniversary of the original publication of A Princess of Mars. 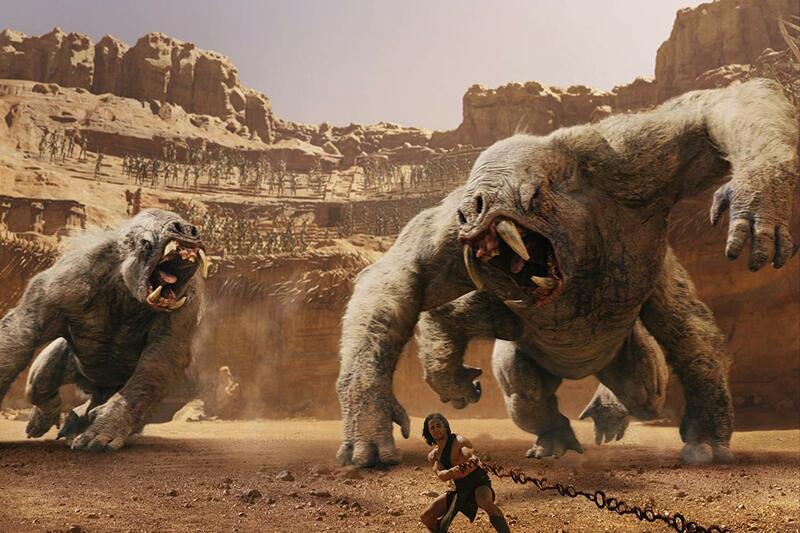 John Carter did almost nothing to inspire one during pre-release. First there was the jockeying around with titles. The work had fairly much always been referred to as John Carter of Mars in all of its previous incarnations as opposed to A Princess of Mars (or even Under the Moons of Mars). Fairly close to release date, the studio made the abrupt decision to shave the ‘of Mars’ off the end and simply call the film John Carter (although the title that comes up on the end credits is still John Carter of Mars). For fan audiences, this reads like a nervous studio jumping far too high through test marketing hoops and being afraid that the word Mars (even if the film itself is set there) would turn audiences off before they entered the theatre – in effect making John Carter into a science-fiction film that is now pretending to be set in a generic nowhere. This also has the effect of reducing the title to anonymity – there are surely few character names that contain more of a nondescript blandness than John Carter. There was also the trailers that went out in the latter half of 2011, which seemed dull and failed to generate any enthusiasm. Nor for that matter did the big lobby stands of Taylor Kitsch fighting off the two giant white apes do anything to inspire one. Moreover, John Carter was also retrofitted in post-production for screening in 3D (a gimmick that is there solely to garner more studio dollars), which is always guaranteed to cause me to develop an instant dislike before even entering a theatre. This lack of enthusiasm about the promotion was shared by audiences with John Carter even being declared one of the biggest financial flops of all time by its studio within a week of opening. It took a little way in but John Carter eventually managed to overcome everything I had against it and cause me to warm up to it. Andrew Stanton and his co-writers have moved the essentials of Edgar Rice Burroughs around somewhat and the film is about four-fifths faithful to A Princess of Mars. The film places far more emphasis on John Carter’s adventures on Earth in the prologue and epilogue than Edgar Rice Burroughs did where he only had a chapter of three pages devoted to Carter entering the cave fleeing from Apaches (Colonel Powell is also Carter’s friend in the book and there is nothing about Carter being a Confederate deserter). The aspect about writing Edgar Rice Burroughs in as a character is in keeping with the book where Burroughs claimed the story was a manuscript that had been given to him by a family friend (although not an uncle as the film makes Carter out to be). The film follows the book in having Carter enter a cave and be transported to Mars – Burroughs always glossed over the hows of the process – although there is also no amulet aiding the travel in the book (which has been added to the film as a McGuffin driving the adventure where it is lost and has to be regained several times). Carter’s adventures among the Tharks and his rescue of Dejah Thoris is fairly much as in the book. However, the book has the main drama be about John Carter having to unite the Green and Red Martians to stop Zodanga switching off the planet’s air-pumping stations, whereas the film ditches this and expands out a plot piece of the book about Carter racing to save Dejah Thoris from a fate worse than death – marriage to the villain of the show. There are also no Therns in A Princess of Mars, although they do appear in the immediate sequel The Gods of Mars (1917) where they are descendants of the first Martians who maintain a cruel false religion that requires people to be sacrificed down the river Iss (which is also not visited in the first book), whereas in the film they are pumped up into godlike beings of alien origin that interfere in the fates of worlds where they are clearly being cast as a major nemesis for the announced sequels. The film writes itself on a vast canvas, which becomes immediately apparent from the opening battle between gracefully intricate airships of Zodanga and Helium. The film’s purported $250 million budget all shows up on screen from the epic-sized action scenes shot in the Utah deserts to the journeys down the tight warren of coils of the river Iss to the ruined cities and richly detailed life of Helium and Zodanga or the Thark encampment. There is the romance, the heroism and the sense of adventure that should have made John Carter perfect for the mega-successful popcorn entertainment that Disney were hoping it would be, while equally the film retains enough faithfulness to Edgar Rice Burroughs to keep the legion of fanboys happy. Yet while John Carter is lavish and epic, it not perfect. The action swashes and buckles with the superhuman derring-do that Edgar Rice Burroughs inspired in a legion of fans – highlight scenes like Taylor Kitsch’s fight with the giant apes in the arena or the climactic battle to save Helium. On the other hand, the film never sings with the sense of pure exhilaration mainlined to everybody’s inner fanboy in the same way that Star Wars did. It may well be that George Lucas stole much of Edgar Rice Burroughs’ thunder and that John Carter is left fighting to carve out its own originality while finding that most of its moves have been done on screen before in one way or another. On the other hand, it certainly breathes and bustles with far more life and imagination to it than any of George Lucas’s Star Wars prequels. The other minus point might be that, try as the visual effects people might, the Tharks still look like CGI animated characters. Somewhere buried under the motion capture suits are well-known acting names such as Willem Dafoe, Samantha Morton, Thomas Haden Church and Polly Walker, although you would not know this without a reading of the credits. Perhaps with the exception of Samantha Morton’s Sola, none of these emerge out of the animated green skins as fully-rounded characters on screen in the same way that say the Na’vi did in Avatar. Some of the humans fare little better. Both Dominic West and Ciaran Hinds, British actors with a more than respectable body of acting work, are stuck in skirts/loincloths, breastplates and capes and seem to be chafing at the bit in being forced to enact one-dimensional roles. Dominic West seems too cuddly to be terribly villainous, while the same could be said for former Spy Kid Daryl Sabara who is far too boyish as Edgar Rice Burroughs. On the other hand, Taylor Kitsch and Lynn Collins seem well suited to the parts of John Carter and Dejah Thoris. Taylor Kitsch’s sudden acclaim as the next hottest thing after his appearance in tv’s Friday Night Lights (2006-11) and X-Men Origins: Wolverine (2009) seemed to be setting him up as no more than an instant one-hit wonder in the same league as the other non-acting Taylor of the moment – Lautner. 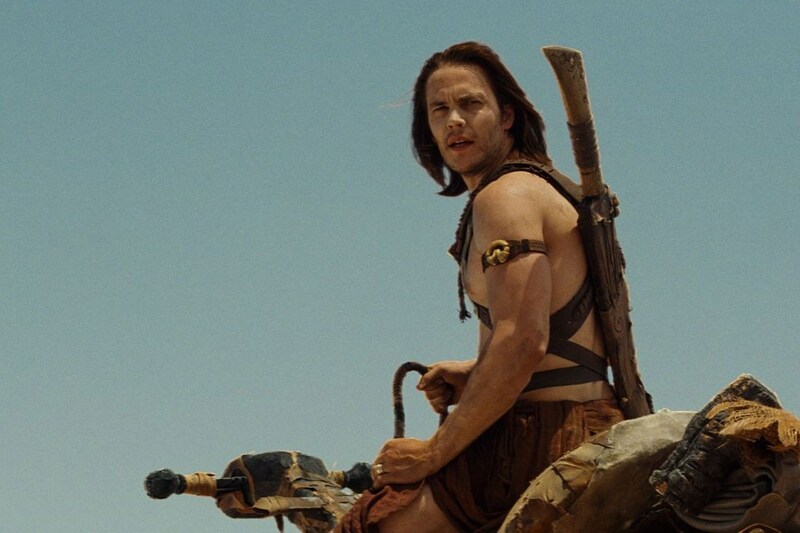 Up on screen here however, Taylor Kitsch inhabits the role of John Carter reasonably well, getting the heroism, a fair depth of background character, the romance and just the right degree of humour off, while giving the impression that he is perfectly at home doing so. There could well be more than just a pretty face here. 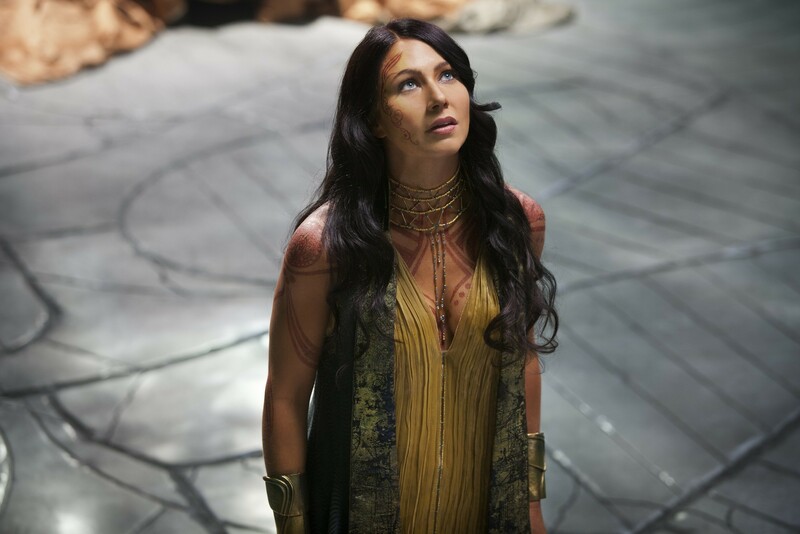 Just as much, if not more, can be said about Lynn Collins who incarnates Dejah Thoris with the right balance of luscious exoticism, feisty fire and regality. The two of them hold the show together. Following the film’s box-office disappointment, Andrew Stanton subsequently returned to animation and Pixar for Finding Dory (2016). (Nominee for Best Special Effects and Best Production Design at this site’s Best of 2012 Awards).